Oh, to be a husband and dad in the 1950’s! This extract from a retro home economics book for girls on how to become good housewives is ROFWL hilarious. If you feel your husband could do with a little more TLC from you though, then you might want to take down some notes. 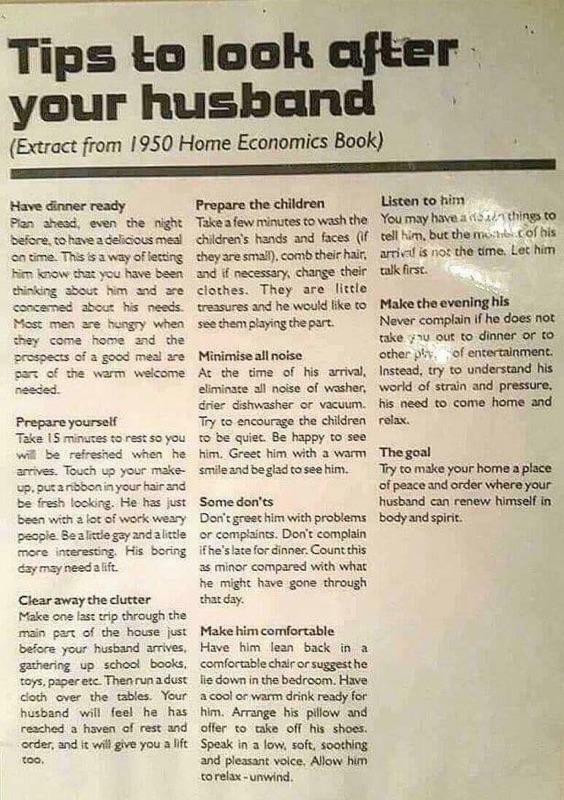 Because husbands in the ’50s were treated like gods. Here are nine top tips from the book, as well as some additional ones from us, for how to treat him better after a hard day at work. Okay mums, this means no last-minute frozen nuggets chucked onto an oven tray after the daycare pick up. Dinner needs to be thoughtfully PLANNED ahead of time, and don’t even think for a second that this isn’t your job. OK? Wipe that “I’m so over it” mum face off right this second. He doesn’t want to see that! HE’S weary. HE’S tired. You are not. And no, you did not have a day at work either. Just tell the kids you need 15 minutes of me-time to get ready for daddy’s arrival. Of course, they’ll understand! Oh and don’t forget to change out of that top that smells of spew. Yes, a haven of rest and order. DO NOT lose your sh!t at him for flinging his shoes off in the middle of the living room again, right after you’ve decluttered and yelled at the kids for never cleaning up their toys. Again, this is YOUR job. Do it without complaint. Yes, do rummage through the washing baskets and find clean clothes for your ‘little treasures,’ who have morphed into monsters come witching hour, which is right about the time he’s due home. Also resist leaving them grubby until bath time. He is not going to appreciate that. Don’t forget to give the kids this memo. Oh, and flicking on the telly for a bit of shush, isn’t encouraged. What if the Paw Patrol theme song annoys him? Just ask the kids to be quiet and still. Easy. Yes, yes. Do not annoy him with stories of how you juggled two little ones with gastro today while also having to work from home because they couldn’t go to daycare, oh and that now you can also feel your tummy starting to growl. Again. HE DOESN’T WANT TO HEAR IT! Mums, this means no shouty mum rage, even if no one is listening to you and your man is looking at his phone instead of the full-blown sibling pushing fight that is happening before his very eyes. No, just keep calm. Allow HIM to relax. You don’t need a drink. He does. Oh just shut up, alright! Again, HE DOESN’T CARE about your day or that your boss is a jerk, that his baby needs a change RIGHT NOW and you’ve got risotto on the stove that needs stirring, or that his pride and joy firstborn dropped the f-bomb at preschool today. Just zip it. Zip. Zip. Zip. Yes, he had a hard day. His barista coffee, that he got to drink without having to microwave 10 times over, didn’t have the two sugars he’d asked for, and when he got to the office kitchen they were out of sugar. He didn’t have time return to the cafe because someone in the office had a birthday and he had to stay and eat cake. Did someone say spirits?! 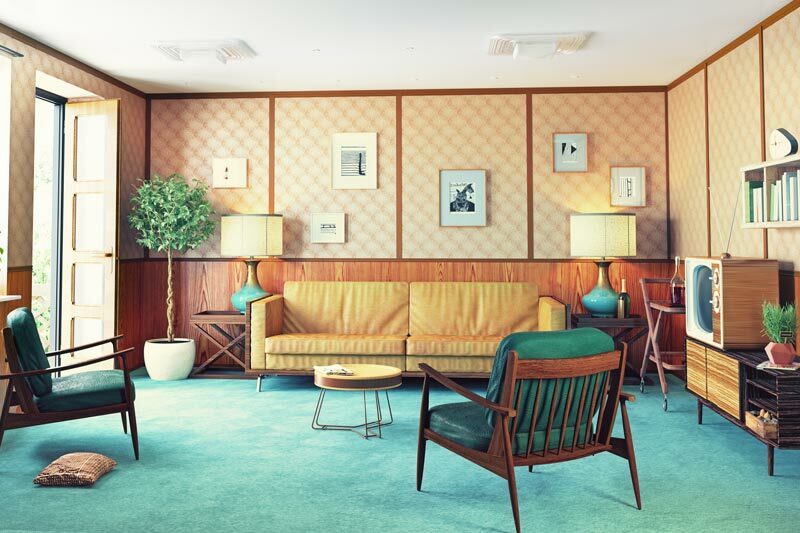 Now, this is a tip we can take on board because we need a stiff drink after reading this.